According to an article in the special issue City of Music in Seattle Metropolitan Magazine, Baby Gramps is acknowledged as one of the top 50 most influential musicians in the last 100 years along with Ray Charles, Jelly Roll Morton, Ernestine Anderson, John Cage, Bill Frisell, Jimi Hendrix, Quincy Jones, The Wailers, The Ventures, Sound Garden, and Pearl Jam. 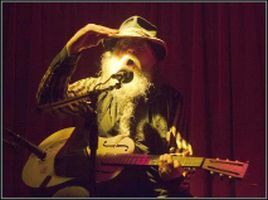 He is credited with making Seattle audiences aware of old blues and novelty songs that the rest of the world has mostly forgotten. Baby Gramps toured England and Ireland a little while back as part of the Rogues Gallery: Pirate Ballads, Sea Songs, and Chanteys CD Concert Tour with Tim Robbins (actor), Martha and Rufus Wainright, Jenny Muldaur (Maria and Geoff’s daughter), Lou Reed, The Watersons, Martin Carthy and Eliza, Suzanne Vega, Ralph Steadman, and many other internationally known performers. The Rogues Gallery CD, produced by Johnny Depp and Hal Wilner in connection with The Pirates of the Caribbean film, landed Baby Gramps on the David Letterman Show with Tony Garnier, Bob Dylan’s bass player and band leader, backing him up on bass. Tony also played a couple of shows with Gramps during his last NYC tour.